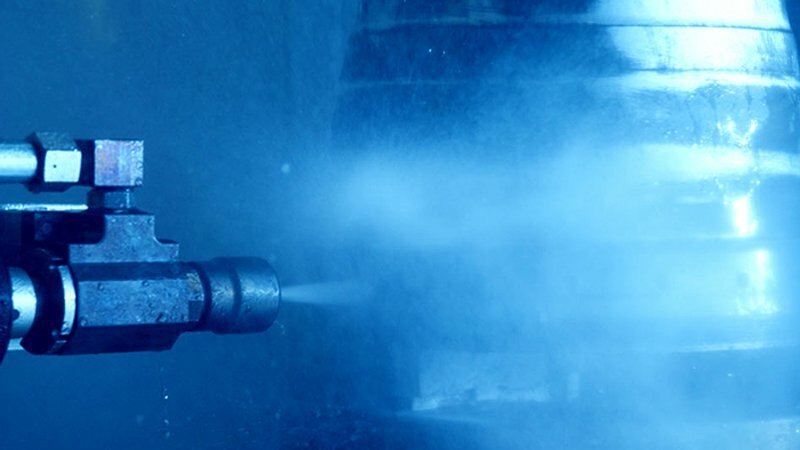 The removal of coatings is a common mechanical process that is applied across many industrial sectors such as Marine, Aerospace, Heavy Industrial Equipment, Transportation and Automotive. Typically, the coating was designed for an intended function such as the protection of a part from corrosion, erosion, heat or friction. After some period of time either the coating slowly degrades or the part needs to go through mechanical inspections at which point the coating needs to be completely removed. With the use of the pulse water jet, the coating can easily be removed using only water and at lower pressures such as 5Kpsi – 15Kpsi. Benefits of using the pulse water jet for coating removal are faster turn-around-time, lower operating cost, lower maintenance cost than ultra-high pressure systems, reusable water supply, no hazardous waste generation and the process can be robotically controlled and fully automated. The PWJ has proven to be very proficient in removing extremely tough coatings such as Chrome, HVOF and thermal spray coatings commonly found in extremely harsh environments such as jet turbines. Other effective coatings removal applications can be found in the removal of marine epoxy coatings on ships decks and hulls.